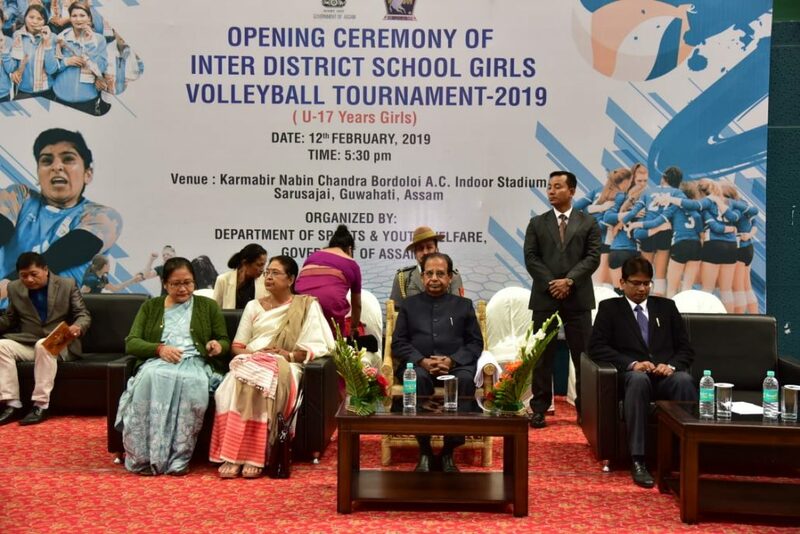 Assam Governor Prof Jagdish Mukhi inaugurated the Inter-District School Girls Volleyball Tournament at Karmabir Nabin Chandra Bordoloi AC Indoor Stadium at Sarusajai in Guwahati on Tuesday. 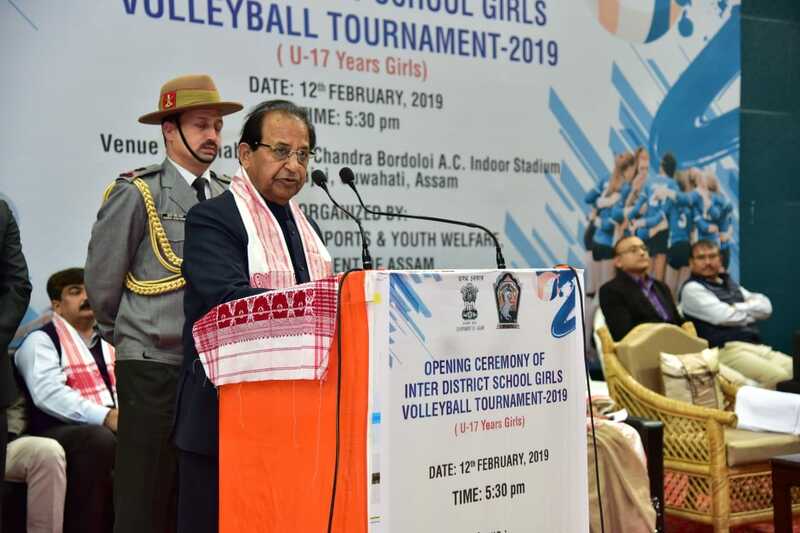 Giving a brief speech on the occasion, Governor Prof Mukhi said,“Considering the popularity of volleyball in the state, especially in the rural areas, I propose to adopt this game and in my capacity I shall work to popularize the game”. He also said that volleyball is a popular game. It is a game recognized by the competent authority. 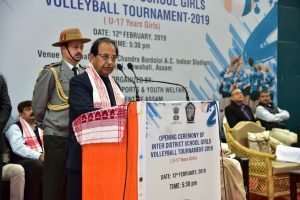 Considering the women folk in Assam largely associated with the game and in view of the talents and skill showcased by them, there is no doubt, very shortly they can rule at the national arena, he said. He also said that volleyball as sport has its inherent advantages. While some sports require several equipment to play, volleyball needs only ball and net and can be played anywhere, where there is space, unlike other sports, he added. Stressing on the importance of sports, the Governor said that sports is important for everybody. It develops qualities which are essential to lead a complete life. It makes one mentally strong and physically fit. Sports are beneficial as they teach punctuality, patience, discipline, teamwork and dedication and devotion. Being in sports help one building and improving confidence level. If sports is practiced on a regular basis, one shall be more active and healthy. “Being involved in the sports activities help one in empowering oneself physically and protect him or her from diseases. It teaches the players to go ahead in life by overcoming all weaknesses. It makes the players bold and gives the feeling of happiness by reducing the occurrence of anxiety,” he further observed. 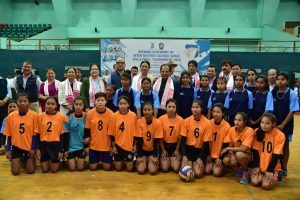 He urged upon the players to showcase their prowess and compete in the spirit of sports. He also wished the organizers as well as the participants all the best for success in their respective endeavour. Vice chairperson Of Sports Authority of Assam, Queen Ojha; commissioner and secretary of Sports and Youth Welfare Department, Ashutosh Agnihotri; secretary of Sports and Youth Welfare Department Neera Gogoi Sonowal; additional secretary of Sports and Youth Welfare Department Kalyani Talukdar; joint secretary of Sports and Welfare Department Ranuj Borkotoky; director of Sports and Welfare Department Dharma Kanta Mili; former national level volleyball player Amba Saikia along with other dignitaries were present in the inaugural function.